About to celebrate an anniversary with your significant other? Nothing says “I love you” like diamond jewelry! Made of the hardest mineral on earth, diamonds are the perfect gift to represent the strength and longevity of your relationship. That’s one of the reason they’re the traditional gift for many anniversaries: diamond jewelry for the 10th anniversary, and diamonds for the 30th and 60th! But when it comes to giving a romantic gift for your anniversary, the heart diamond necklace is appropriate for any year. Here are just a few reasons why! The heart cut diamond is a modified version of the round brilliant, which has extra facets for maximum sparkle. The sparkle of a heart diamond is unique, but it isn’t the only special thing about this particular shape. The heart cut diamond is also one of the most difficult cuts to create. Diamond cutters must use special tools in order to create a perfectly symmetrical heart shape, which can make this diamond shape more expensive than simpler fancy shapes. However, the special care that goes into every heart diamond will work in your favor and make the gift even more one-of-a-kind. Diamond engagement rings have been the standard token of matrimony and commitment, but did you know that necklaces have their own meaning, too? In ancient times, jewelry took more time and resources to create. Neck jewelry made of precious metals or stones would have been worn with a purpose, to express belonging to a certain class or group. Early Christians began wearing crucifix necklaces to demonstrate their relationship to Christ. By wearing their tokens around their neck, they were putting their faith and devotion on display. That symbolism has survived throughout the centuries. Today, a necklace worn today is a proud display of personality, beliefs, or love. Giving a necklace to a loved one to wear is a physical expression of your deep connection to them. And how can you make the romantic gesture any more romantic than with a heart, the everlasting symbol of love? Whether because of their sparkle or symbolism, heart cut diamonds have been a popular fashion statement—especially among royalty. 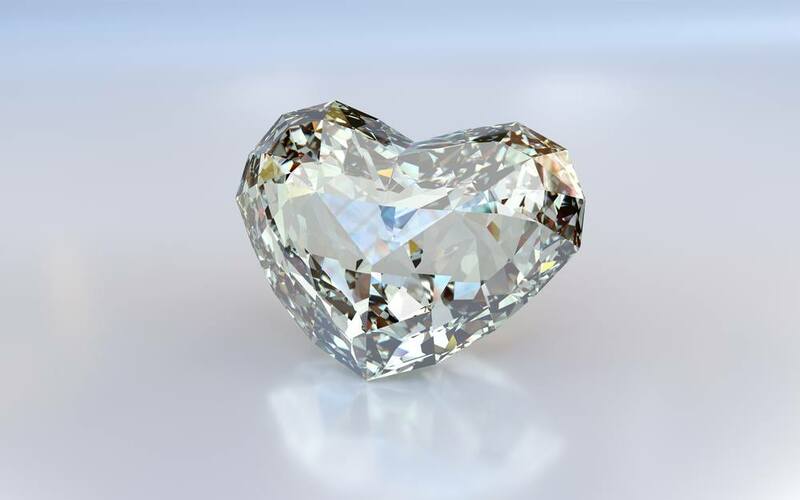 In 1910, Queen Mary was given a heart diamond cut from the Cullinan Diamond, the largest diamond ever found. In 1951, the Duke of Windsor bought a 47-carat yellow heart diamond for the Duchess; it was later bought by Estee Lauder, who set it in a pendant. Perhaps the most famous heart shaped diamond necklace, however, is the Taj Mahal Diamond. The jewel is believed to have been created in the 17th century, during the reign of Jahangir Shah—the Mughal ruler who built the Taj Mahal—as a gift for his favorite wife. But most people today know it for it’s Hollywood royalty connections. The diamond was acquired by Cartier in the 20th century, given an extravagant ruby and diamond setting on an exquisite gold chain, and then sold to Richard Burton, who gave the storied jewel to his then-wife Elizabeth Taylor. Taylor was famous for her glamorous and enviable jewelry collection, and the Taj Mahal diamond is one of the collection’s most well-known pieces. You can make your significant other feel just as glamorous as Elizabeth Taylor by purchasing a heart diamond for your next anniversary. 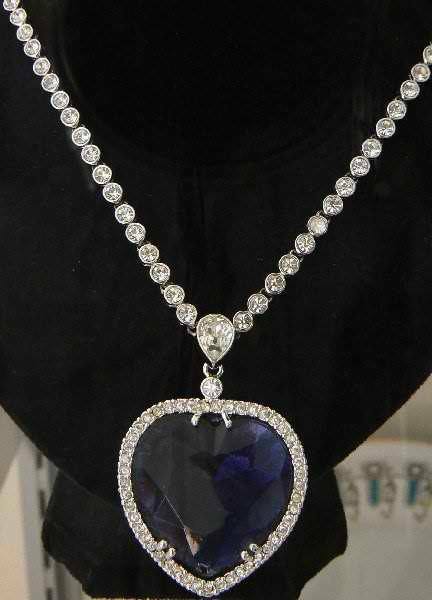 Another famous Hollywood heart diamond necklace is the fictional Heart of the Ocean, from Titanic! While the story behind the heart shaped necklace isn’t real, jewellers Asprey & Garrard were commissioned to create an authentic necklace using this a 171-carat heart-shaped Ceylon sapphire, surrounded by 103 diamonds. Why have so many royals and celebrities found pleasure in heart diamond necklaces? The answer is in the natural complement the shape has for the neckline, following the lines of a woman’s collarbone. They can be worn high for a sophisticated elegance, or low for a more dramatic, seductive effect. The heart diamond necklace is the perfect accessory. Jewelry trends—especially when it comes to diamond cuts—come and go. But, a heart diamond is a timeless shape because it will always celebrate love and passion between two people. If you want to buy a piece of jewelry that will stand the test of time just like your love for your significant other, there’s no better choice than a heart diamond necklace. The piece is guaranteed to become an heirloom handed down with love and meaning for many generations without ever going out of style. Whether you’re celebrating six months or sixty years with your loved one, a heart diamond necklace is the perfect way to express your devotion and commitment to your partner.